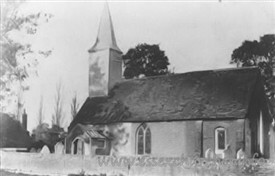 When Little Stambridge St. Mary’s was demolished one window and its stone surrounds was saved and later installed in the west wall of the south aisle of Great Stambridge church where it can be seen today. The bell also survived the demolition. This was a rare Peter Hawkes bell made some time between 1608 and 1620. This 20 inch bell was inspected at great Stambridge Rectory (now Stambridge Meadows residential care home) in 1909 but it has not survived and its eventual fate is unknown, but it was probably scrapped at some time. In 1909 there were 6 surviving Peter Hawkes bells, one at Shopland Church, but today there are only two. It has been speculated that Hawkes, like other bell founders at the time, was itinerant and would move around to different locations with his foundry equipment and setting up where required, often re-casting previous broken or cracked bells. It is also speculated that he settled in Braintree where the name is common on the church registers, but they only go back to 1660 so this is far from certain. A silver chalice and matching cover from Little Stambridge church was sold, in March 1904, at Christie's of London for £96. It was 6 ½ inches high with the bowl section engraved with two bands of foliage and the stem and foot decorated with dotted bands. It had a 1562 maker’s mark on the cup and a 1569 maker’s mark on the lid and a 1570 London hall mark. The money was used to purchase an organ for Great Stambridge Church. The previous organ at Great Stambridge was sold to Canewdon where it is still in use today. It has several angels painted on the case that have the faces of girls who attended Great Stambridge Sunday School in around 1900. This page was added by Brian Meldon on 17/04/2014. I asked my good friend and renowned bell historian David Sloman about the former bell at Little Stambridge. He confirmed that it was sold and melted down by bellfounders John Warner & Sons. However all is not lost as the inscription was cut from the bell and is now held in store along with other church bell fragments (and complete bells) at the Victoria and Albert museum (the bell fragments are not fully catalogued on-line). The inscription in gothic letters reads ‘peter hawkes made me’. I have also traced the possible location of other items from Little Stambridge church that may yet survive in the local area. In 1901 the piscina (a shallow basin used for washing the communion vessels) and a cross from Little Stambridge church were given by the then vicar of St. Peter’s Paglesham to St. Mark’s Church in Hamlet Road Southend along with other items. The piscina was apparently built into the sanctuary at St. Marks that year when the building was modified to become an Anglican church with the cross placed outside. This church was built in 1885 and prior to 1901 it was known as Hamlet Road Baptist Tabernacle. The cross is no longer visible outside. However I have never been in this church, mainly because its victorian construction has little interest to me but, with the possibility that the probably medieval piscina from Little Stambridge Church survives within, I will be visiting as soon as I can to take a look.